Missouri defeated Arkansas Friday, 21-14, to win the SEC East for a second straight year. Fans rushed the field to celebrate. Obviously I may have a bias towards this subject, but I’m going to do my best to look at this as a journalist. After all, I’m paying (actually my parents are paying) north of $30,000 a year for me to go to school to be a journalist. And, if my classes have taught me anything, it’s to leave all biases out of your writing. I will do my best when writing about the Missouri Tigers’ football team. 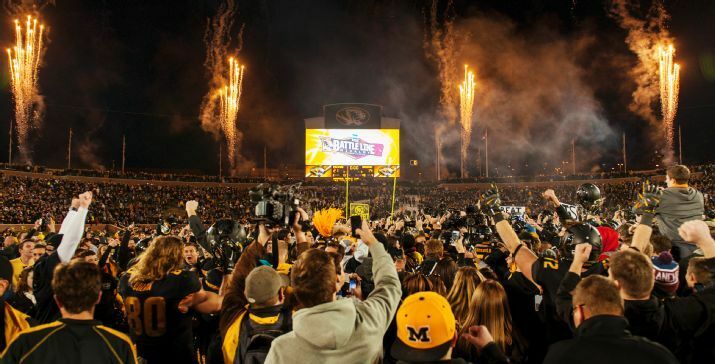 Friday, in front of a sell out crowd at Faurot Field in Columbia, the 17th-ranked Tigers were able to defeat the Arkansas Razorbacks 21-14, winning the SEC East division and putting Mizzou in the SEC title game for a second straight season. That’s a pretty big deal if you ask me. Yet, if you flipped on Sportscenter Friday night, you didn’t see the highlight of this game until over halfway in to the show. And then the highlights only went 20 seconds. Before you could even realize Mizzou had won the game, they were moving on to promoting the big Saturday games. 20 seconds. That’s it. I know Missouri doesn’t have the name power like Alabama, Florida State, USC, Texas, Notre Dame, etc. Chances are, Mizzou will never reach that level. Even if the Tigers won a national championship, they’d never have the same recognition of those teams I listed above. However, you have to realize when something important happens and report on it. Going in to Friday, there were three big college football games with conference title game implications: UCLA vs. Stanford, Arizona State vs. Arizona, and Missouri vs. Arkansas. Those three games right there should have been the lead of Sportscenter. They showed the two Pac-12 games right at the start and even had an analyst break them down. Meanwhile, the NBA, NFL, and other college football games like Nebraska vs. Iowa and Navy vs. South Alabama had their highlights shown before Mizzou and Arkansas finally had any screen time. And if you blinked, you probably missed the highlights. How do you show highlights of two MEANINGLESS games before you show the highlights of a game that determined the SEC EAST?!?! The SEC, which ESPN loves so much they made a network for them, was buried on their show. You know why? Because it’s Missouri, that’s why. If Georgia had been playing for the SEC East yesterday, that would have led the show. But it’s Mizzou, and nobody really cares about them, right? I mean they lost to Indiana for crying out loud! Who does that? Has Missouri been the best team this year? Absolutely not. The losses to both Indiana and Georgia were painful, and they really haven’t looked pretty in most of their wins. But they’re winning, and that’s all that matters. And Friday, they had a shot to win the SEC East for a second straight year, which had only previously been done by Florida and Tennessee. You know if one of them were about to win the SEC East it would have been the top story Friday night. I’m not trying to come off as bitter right now to ESPN. In all honesty, I love ESPN and hope someday to work there. It’s just hard to sit and watch Sportscenter and have arguably the biggest game from Friday not get mentioned for the first 30 minutes of the show. And then when it is mentioned, it’s talked about for 20 seconds and that’s it. And, in all honesty, I shouldn’t be mad at all. The school I go to, once again, is heading back to Atlanta for the SEC Championship game. They were underdogs in their final three games of the season, yet rose up and proved the doubters wrong. After the Georgia debacle, the Tigers won six in a row to close the season. Couple that with Florida beating Georgia, and Missouri has a chance, once again, to win the SEC title. Also, as crazy as it sounds, Mizzou still has college football playoff dreams at this point. 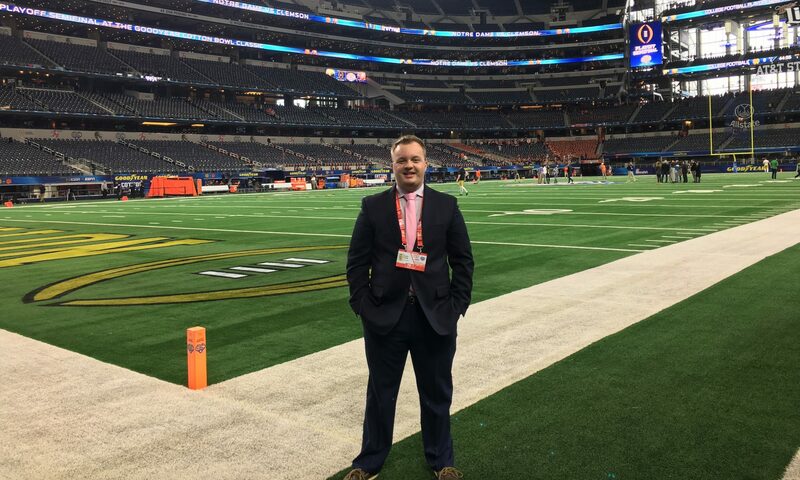 If Missouri upsets either Alabama or Mississippi State in the SEC title game, they could have an argument to be playing in one of the national semi-finals on New Years Day. There’s a slim chance of that happening, but that’s what Mizzou’s season has really been all year: a slim chance. I will be in Atlanta next Saturday for the game. I know Missouri will be a huge underdog to whomever they play, and they may get blown out to either Alabama or Mississippi State. But they made it back to Atlanta, against all odds, and will have a shot to win the SEC Championship. That at least should warrant some respect.